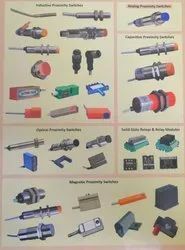 Pioneers in the industry, we offer capacitive proximity switches and autonics proximity switch from India. The switch works on the principle of a resonant oscillating circuit. A pair of brass/copper disc form the electrodes of a capacitor & the object acts as a dielectric media. The change in capacitance value, due to the presence of an object, is sensed by a precision integrated circuit. An effective output signal is generated at a preset value of capacitance. M18 to M80. The enclosures are made of Brass, Stainless Steel or Engineering Plastics. Special shapes, Teflon housings are provided against requirements. Standard models are provided with an integrated 2-meter long cable. Connector type versions are available with built-in male connectors. The nominal sensing distance of any size of the switch is specified with Water as a standard object and tested at 25 Degree C. Depending upon the material of the object to be detected, the distance will vary. The sensitivity of the sensor is adjustable with a trimpot provided usually on the rear side of the sensor. The sensing distance is affected by the change in ambient temperature, humidity, size and material of the object. Special High-Temperature models of Capacitive switches are available with Operating Temperature up to 150 degrees C max. These switches are provided with a Teflon front cap and with suitable Teflon cable. These switches are to be used with a specially designed controller/amplifier unit. The permitted operating length between a sensor and the controller is maximum 10 meters. NAMUR type switches are available with CMRI-Certificate and approved Power Supply Unit with built-in Zener barrier circuit. All the Capacitive switches are provided with Reverse polarity, Overload, short circuit and false pulse protections. Rugged construction along with the IP-67 grade of protection renders these switches to be very useful for liquid level monitoring applications. 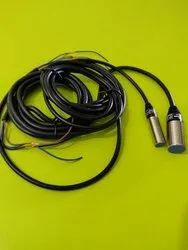 AUTONICS PR Series Cylindrical Type Proximity Sensor enhance superior noise resistance characteristics with dedicated IC. The series can be widely used in any applications where proximity sensors are required because of diverse range of line-ups in terms of size and sensing distance.